Since 2007, thousands of people have had successful remote training help from me when everything else failed. Holistic online training is proving to be the most effective training method available. Working with a trainer online is supportive and empowering for both you, your family, and your dog. Not only does it help balance your dog's body, mind, and spirit, but it also reinforces a balanced relationship between all family members that are involved in the training process. 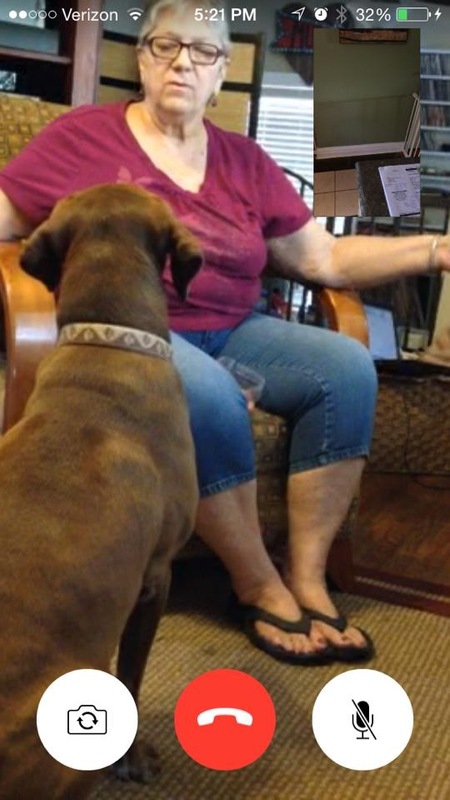 It's so easy that even a small child can learn how to train a dog with online coaching. what is a Mind-Body-Spirit training approach? No other dog training modality combines a more complete body-mind-spirit approach. *) Usui Reiki for animals facilitated by Reiki Master Roman Gottfried. The only difference between online and in-person training is that I'm on a video feed instead of at your house. I call you on whatever live feed video is most convenient for you- Skype, FaceTime, Facebook Messenger, or Hangouts- and walk you through the training process. I demonstrate on one of my dogs what I want you to do, then watch you as you practice on your dog, and correct you if necessary. If you like to have a copy of your training session i can record it on ZOOM. how is online training better than In-home training? Online Training has many advantages over having a trainer coming into your home. Online session can be recorded and available for 30days, and be downloaded for a small administrative fee. Online coaching can help you also complex behavior issues that most trainers wouldn’t not be able to address. Watch the video below what a Great Pyrenees Lover experienced with his aggressive dog! If you need only one training session to refresh your Holistic Training skills, or your dog shows minor behavior issues, then this is the right session for you. Many people see huge improvement with only one session in 60% of behaviors. Schedule a initial online training session for $60. Screenshot of a online video consultation. With holistic approach in online training, you become the educated trainer your dog is looking for. For more complex issues like aggression, trauma, multiple dog home, home with children, dog disputes and dogfights or aggression towards people, the premium training session, is the best session to start with. We will have time to identify the family dynamics, understand your dogs relationships., identify the triggers, underlying causes and complexity of your dog's or dogs behavior. This is the best single session if you have dog-dog disputes or human-dog disputes with a reactive dog that shows signs of aggression. * This might stabilize the situation in your home and give you time to make arrangements, however, from experience a Behavior modification bundle is the best long term solution. *) If your dog is usually calm and loving but suddenly displays aggression, your first course of action should be to see your veterinarian and rule out pain or medical issue before scheduling a session with me. This session is for complex dogs or multiple dogs home with aggressive behavior, severe trauma or if there is no information about their past. Remote Re-connective Healing uses the quantum energy field, source light and information to bring the animal’s mind, body and spirit into optimal balance and restores them to a state of wellness. Over many years I have incorporated Usui-Reiki into my training practice but i saw amazing results using re-connective healing it to heal trauma, pain, energetic blockages and emotional stress. during the session animals can experience deep emotions, mental anguish and overactive physical stimuli and even unknown vocalizations. The Premium Behavior Healing Session often helps reduce the expected training sessions in some cases behavior completely healed after one session. The origins of the archetypal hypothesis date as far back as Plato. Plato's ideas were pure mental forms that were imprinted in the soul before it was born into the world. They were collective in the sense that they embodied the fundamental characteristics of a thing rather than its specific peculiarities. Roman was able to open my eyes and look at things differently. I had successfully rehabbed many food aggressive dogs in the past but Larry was different. A couple things Roman explained helped me understand the dynamics in my home. The archetype description on my dogs matched and made total sense. it helped me understand why the dispute hapened and how to adress them. I recognized that using these archetypes would be helpful when it comes to identify and create a virtual representation of a family system that includes different species. In order to create balance the Family system each member of the family has to adjust his energy accordingly. The Systemic Archetype Reading is an intuitive approach to capture a "energetic screenshot” of a family system. It gives a present representation of each member’s archetype and its relationship within. It helps identify behavior patterns in search of energetic blockages that affects the whole family system including the animals living within. This online package is designed for New Dog Parents with puppies or dogs with moderate behavior issues ( excluding aggressive behavior toward humans), and is the most popular package. It ’s tailored to your dog's unique needs and your training goals. If you have a human aggressive dog or a dog with serious emotional or physical trauma, I suggest the premium package instead of this one, which includes a systemic evaluation. I specialize in complex behavior issues and have created a package specifically for “problem” dogs. Two “laser” sessions. These are roughly 20-minute online troubleshooting sessions that can be used for a specific behavior that needs to be addressed immediately. An example would be a behavior that the dog wouldn’t normally show when I’m there, like barking at the garbage man. Skills you can use with every dog in your life. I’m now offering a payment plan for this package. Contact me for further information regarding paying in installments. > Money back guarantee if you don't see progress after the first session. > No Refund of remaining sessions after booking the second session. > No refund of setup fee. > Client is responsible to submit his video-homework 3-4 days after previous session, and to schedule his follow up session every 5-10 days. This premium package is designed for New Dog Parents with puppies or dogs with extremely complex behavior issues. Post Traumatic Stress Disorder, Aggression against humans and animals, Injury related behaviors, dogs with no behavior history records, etc. It ’s tailored to your dog's unique trauma, needs and your training goals. The training session starts with a remote Reconnective healing session facilitated by Barbara Buck - re-connective healing practitioner, followed by a remote systemic behavior evaluation. second session is again a healing session followed by four followup sessions. Konrad Lorenz the Nobel price winner and god father of modern zoology, emphasized that imprinting was unlike other forms of learning for two reasons. First, it happened during what he called a critical period — a definite phase during which the learning had to occur (although this varied depending on the species). Second, Lorenz argued that imprinting was permanent and irreversible. The first 16 months of your puppies development are crucial. Thank you Roman, you helped me online line with my Cane Corso Ceasar a long time ago. He was aggressive, runt of the litter and with your guidance taught me and my family, how to deal with him, force free and pain free, in just five sessions. He is 9 years old now, he still respects us and we respect him and the breed. As former Foster dog trainer, boarding and daycare service professional I know how things can get serious with a dog in your care. Sometimes having a second opinion or someone to talk to and brainstorm makes a huge difference. I coached hundreds of professionals and have created awesome professional relationships with colleagues, and rescues. Need Help dealing with a client or dog?